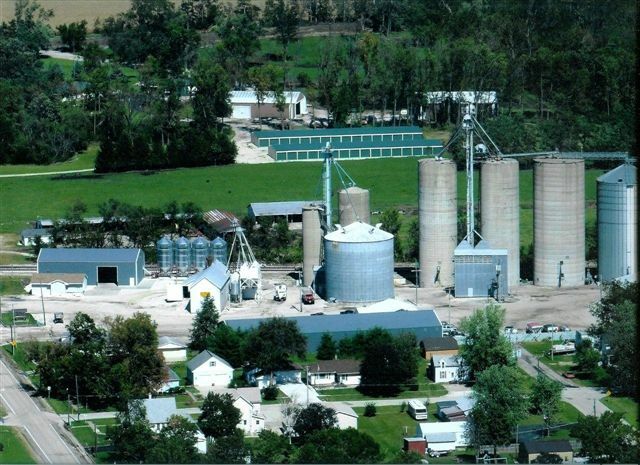 We are the largest agriculture service and supply corporation in northeastern Atkinson, Illinois. We specialize in liquid and dry fertilizer and chemical application, grain merchandising, grain drying and storage, Pioneer Seed, and Kent Feeds. We also have a branch located in Hooppole, Illinois. Together, we employ about 20 of the most highly skilled, good looking, intelligent, trustworthy, honest and dependable individuals in the world. Our biggest challenge is to keep up with the needs of the most highly skilled, good looking, intelligent, trustworthy, honest and dependable group of customers in the world. They are the backbone of America. Without them, the world goes hungry. Without them we would need to find different jobs that we wouldn't enjoy near as much. So, we appreciate their trust and work hard so that we might deserve it. Bob Anderson is President and CEO of Atkinson Grain. He is the Big Kahuna. He built it from a small old wooden elevator with 35000 bushels of storage to the facility that we now know with more than 3 million bushels of storage. He is the Great White Father. His is the last word on any subject. What he says goes. He walks softly and carries a big stick. He is the Master of the Universe and the King of AGF. Tim Anderson invented corn and soybean marketing and the Internet. (Oh wait, I guess Al Gore invented that). He is a genius in the field of grain and the contracting of grain. He has ideas for marketing plans he hasn't even thought of yet. When Tim says the market is going up you can bet that somewhere in the world there is a market of some sort that is going up to some extent. Phil Mickelson would give up golf if he could market grain like Tim Anderson. Dan Callison's brain is huge. It would have to be in order for him to keep track of all that he has to keep track of. As Dan gets older, he just keeps getting smarter. Danny invented computers and copiers. If there is something about them that he doesn't know then it ain't worth knowing. Danny's favorite pastime is sending out bills. Our customers really appreciate the speed with which he can get a bill to the mailbox. Blake Haverback's knowledge of fertilizer and chemicals is surpassed only by his ability to lay a rolle bolle on the stake under pressure. His agronomic ideas are studied in universities throughout the world. His expertise is so advanced that we can only guess what is going on in that head of his. His NASCAR pool is a marvel and is enjoyed by millions. If he ever gets out of the chicken business Northern Illinois will surely experience an egg shortage the likes of which we have never seen. Jim Geuns is "THE GURU" of animal nutrition in Earth's Northern Hemisphere. His motto is "If it sh**s, I can feed it". Cattle will not take a bite of anything without Jim's blessing. In the field of genetics his knowledge is unsurpassed. He has "assisted" in more inseminations than Wilt Chamberlain. His arm is registered with the Society of Artificial Insemination in San Antonio, Texas. Joe Buysse is the President of Pioneer Hi-bred's Atkinson Grain retail division. Joe's expertise in hybrids grows along with his crops on his farm located in the highly fertile regions of central Loraine Township. It is there that "Mr. MOPAR" does a lot of his own research in the field of Biotech and Dodgetech, for which, he is known worldwide. For most of his adult life he has been out standing in his field. Tari Kneen is the Chief Financial Officer and Vice-President of Computer Science and Accounting Practices at AGF. Tari is diligent, innovative, and persistent. If she sees a number in her paperwork that doesn't look quite right, she will NEVER quit digging until she gets it right. She can run any type of report that will tell you anything that you could ever want to know about anything that could possibly be known about anything. Cindy McNeil is Vice-President in charge of Customer Relations and Scale Operations. She is our first line of defense against tele-marketers and crank calls. She is tireless and totally devoted to her career and her family. She is a marvel in the field of multi-tasking. She can answer the phone, manage the scale, operate the CB radio, be really nice to everybody and be Steve VanOpDorp's sister (poor girl) , all at the same time and never taking a break to rest. And you know that sister thing has got to be tough to handle. Ron Thompson is President of Operations at AGF. Ron is intensely devoted to the smooth flow and operation of the equipment and manpower in the grain facility of the main plant at AGF. If there is a piece of grain equipment at Atkinson Grain, it is there because Ron either designed it, built it, or installed it. He is an expert in all facets of grain handling and custom spraying equipment. He is in the process of writing a book entitled ""Grain handling equipment for Dummies". Mike Taber is President of Fertilizer Logistics at AGF. His theories on "Hydraulics and the Effects of Viagra on Fertilizer and its Pipes" are studied and discussed throughout the civilized world. Mike is the world's foremost expert on fertilizer and chemical compatibility. He can do a compatibility test faster than Rusty Wallace can win the Daytona 500. He has forgotten more than most people will ever know about the mixing and compatibility of fertilizer and chemicals. Mark Heitzler is Vice-President of Fertilizer Logistics and Manager of the Manufacturing Division at AGF. Mark is unsurpassed in his ability to build fertilizer in large amounts, in a moments notice, under great pressure. He has no equal in this regard. The greater the challenge, the more he digs in. The quantity of his output is only surpassed by the quality of what he puts out. He is like a fine French chef putting together a recipe for the finest chocolate mousse fit for a King. Vern Sturtewagon is President of Soybean Receiving, Shipping, and Inventory Control. Because Vern has a PHD in Application Science it is also his responsibility to instruct the new students at Atkinson Grain University in the fine art of professional custom application. With his new hip, he now has more replacement parts than the Bionic Man. He also thinks he knows how to Rolle Bolle. Randy Noord is President of Vehicle and Equipment Maintenance at Atkinson Grain. If you think he looks a little stressed out, then let me give you an example of what his day is like at AGF: RANDY THIS TRUCK WON'T RUN!, RANDY THIS TRACTOR WON'T SHIFT! RANDY THAT MOTOR DON'T SOUND RIGHT! And Randy just dives in faster than a NASCAR pit crew and gets everything running just right, and saves the day every time. Tim "Doc" Anderson is President of Versatility, Information, and Agitation. If it can be done, Doc can do it. From the high oil corn dump, to the retail fertilizer load-out, to the GPS Soil Unit, to the Looking Good facility, to having knowledge of everything that is going on in Henry, Whiteside, or Bureau Counties, or to being able to throw in just the right "dig" at just the right time, Doc is a master. His Lawn and lawn equipment expertise is revered from Whyoming to San Hose. Jeff "Louie" Alexander is President of Feed Operations and VP of Seed Sales and Inventory Management. Seed and Feed do not move in or out without Louie's approval and direction. His awareness and his attention to detail show up big when you walk through his warehouse and realize that there is a place for everything and everything is in its place. Nobody does it better. He also knows more about fire works and pyrotechnics than a rocket scientist. Ron VanDeGenachte is President of Vice and Manager of the Starter Fertilizer and Micronutrients Distribution Division of Atkinson Grain. Ron travels all over the world checking for new vices and making sure our customers don't run out of product while he's on duty. Ron always is careful to try out new vices he discovers before he includes them on his Vice List. He wouldn't want to add a vice that wouldn't measure up to his high standards. Dan Rick is President of Operations in Hooppole and Speaker of the House for AGF. Dan uses his many, many, many years of experience to manage the operations, consult with customers, and provide solid agronomic answers to the problems associated with the weird weeds and variable soils in the Hooppole area. Dan's position as Speaker of the House gives him opportunity to offer his opinions and provide the best stories you ever heard about almost any subject you might think of. He's got good stories, and they are all true to the best of his knowledge. Wes Roselieb is President of Application Science in Hooppole. Wes not only has a PHD in Sprayology from the University of Hooppole, but he could teach the subject. Wes knows every weed or wet spot in every field on every farm in every township in all the counties surrounding Hooppole. Wes is also owner and operator of the largest rabbit breeding and finishing facility in the area. Besides fertilizer season, Easter, is Wes's second busiest season of the year. Dean Meier is President of Fertilizer and Chemical Distribution in Hooppole. Dean travels at a high rate of speed to de-liver our products in a timely manner to our customers in Hooppole. If you need something tomorrow and order it today Dean will have it there yesterday. Dean can deliver more fertilizer, throw more bags, scoop more rock, hammer more nails, and drive more miles in less time than is humanly possible for two men to do.